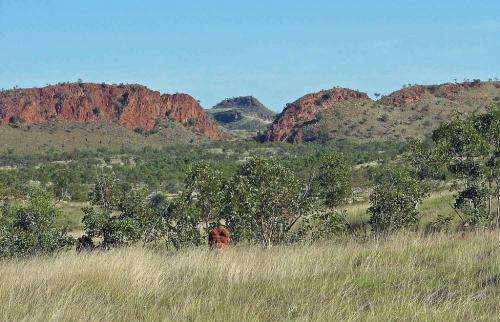 A geological survey has confirmed that a section of the North Australia Craton was forced under its neighbouring tectonic plate and in the process created the hills that stretch from Halls Creek up to Kununurra in the Kimberley. UWA Winthrop Professor Mike Dentith says the hills themselves, known as the Halls Creek Orogen, may have once been as high as the Alps if not higher. They were formed when the North Australia Craton collided with a smaller tectonic plate called the Kimberley Craton. Tremendous pressure forced the edge of the North Australia Craton westward and downward under the Kimberley Craton, forming both a sloping slab of rock and the hills on top. Geological Survey of Western Australia project manager Dr Julie Hollis says it probably penetrates to the lower limit of the earth's crust. "It's a clear, very well imaged geological feature and it matches quite well [with] the geological interpretations based on the mapping work that was done… back in the late 80s and the early 90s," she says. W/Prof Dentith and Dr Hollis are part of a team that inferred these results from their magnetotelluric study of the Kimberley Craton. W/Prof Dentith says the magnetotelluric survey is an entirely passive technique, measuring the energy that naturally occurs in the earth. "We make a magnetic reading and an electrical reading," he says. "The magnetic sensors consist of three coils in three different orientations: two horizontal orientations and a vertical. "Electrically we make two measurements north-south and east-west, and it's by comparing the electrical and the magnetic readings that we can infer the electrical properties. "The depth variation that we use to create the cross section is all to do with the rate at which the magnetic and the electrical fields change. "The way you interpret geophysical data is you effectively make a digital conductivity model of variations in the earth and compare it to what you've got." W/Prof Dentith says the magnetotelluric survey is a relatively inexpensive way of mapping the underlying geology of large areas like the Kimberley Craton. He says the data they gathered is so complex that it will take some weeks for the iVEC super computer to collate, before they are able to produce a paper. Dr Hollis says the survey helps fill a major knowledge gap. "We don't know a lot about the geology of the Kimberley region that is buried beneath the sandstones of the Kimberley Basin, it's one of the big unknowns in the geology of Western Australia," she says. The UW reference lacks such, too.